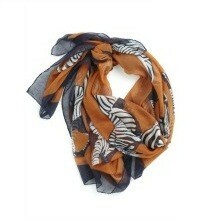 No matter where you roam, this Zebra-print scarf will be wildly popular! The sheer, curry-colored fabric keeps you cool as you scour the savanna for photogenic fauna. Later, you’ll be the envy of the urban jungle when you trek through the streets in this oversized accessory. Loop this look over a tee and khaki shorts for casual adventures, or wrap it over an LBD and explore your sophisticated side. Whether you’re feeling fun-loving or going formal, you’ll look fierce swathed in this scarf! Measures approximately 67.5 inches in length, 44.5 inches in width. Machine wash cold. Do not bleach. Low iron. Dry cleanable. Do not tumble dry.